When any new jailbreak is released, the majority of the social interest seems to be about the iPhone, iPad and iPod touch users. The portable Apple TV device doesn’t seem to command a large slice of the attention, but it is worth noting that the device does run its own version of iOS and as a result can be jailbroken untethered, all thanks to pod2g’s exploit. Jailbreaking the Apple TV follows the same pattern as any other iOS device and requires the implementation of a bug into a distributable tool which in turn can deliver the jailbreak payload into the TV device. Once the Apple TV has been jailbroken, it is possible to many additional features and services such as BBC iPlayer, local weather services and purpose built Bluetooth stacks. Regular jailbreakers will be familiar with software such as Redsn0w, PwnageTool and Sn0wbreeze which are used frequently across the community to provide freedom to millions of devices. 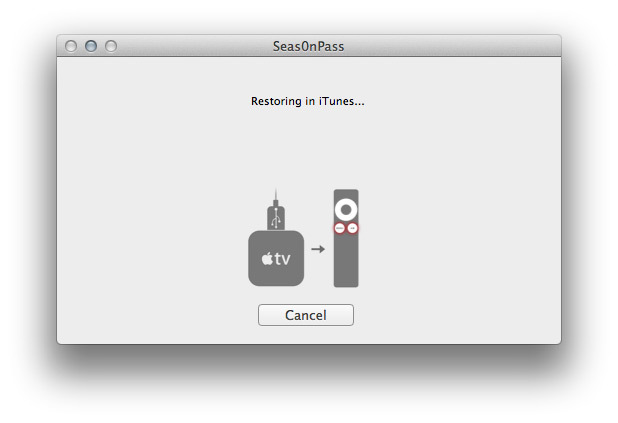 However, a less known tool exists called Seas0nPass, which is used to exclusively jailbreak the Apple TV 2G. 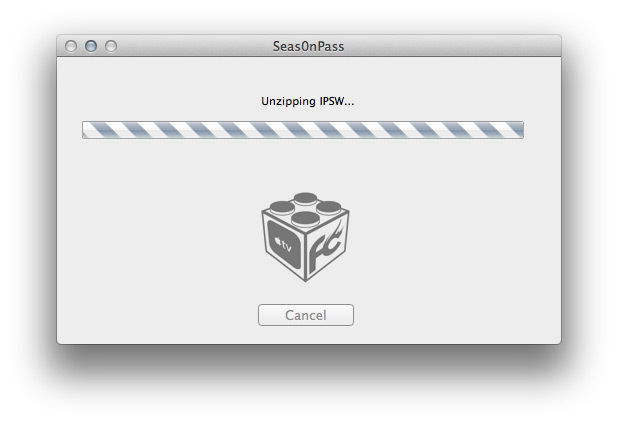 Seas0nPass creates a custom IPSW file which allows a restore based jailbreak as opposed to a ramdisk jailbreak. An Apple TV (second generation). PC with Microsoft XP or later. 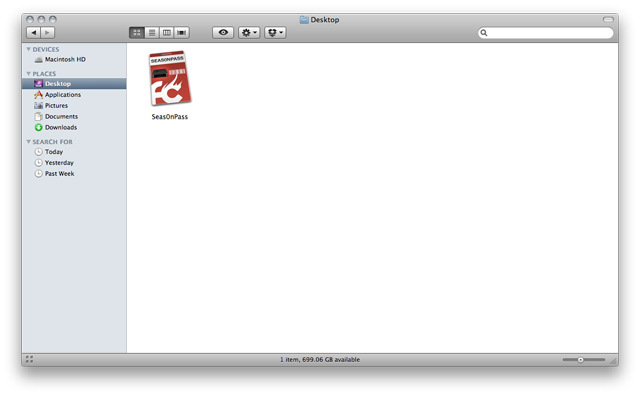 The latest version of iTunes (free download from Apple). 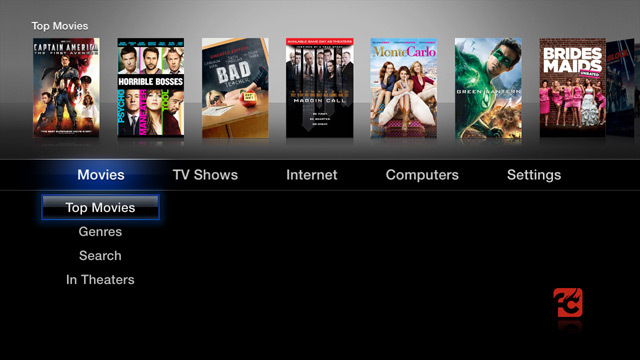 AirPlay Mirroring – wirelessly stream what’s on your iPad 2 to your HDTV. Photo Stream – view photos recently taken on your iOS device and pushed to your photo stream in iCloud. Trailers – A whole new way to browse and view hundreds of the latest movie trailers (region specific). National Hockey League – watch live games. View highlights, scores and more. Wall Street Journal Live – watch up to date news, business commentary and financial analysis. If you are planning on updating your Apple TV to the latest build of iOS in order to use Seas0nPass to achieve an untethered jailbreak, it is worth noting that the Plex plugin is currently not supported. So you have all of the required equipment listed above, you have downloaded the latest version of Seas0nPass, and now you want to set your Apple TV free? 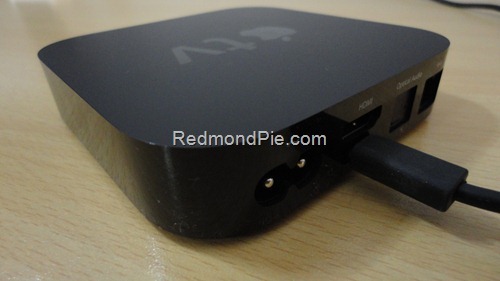 Excellent, just take a few minutes to familiarize yourself with the step by step instructions below which will walk you through jailbreaking your Apple TV running firmware version 4.4.4. 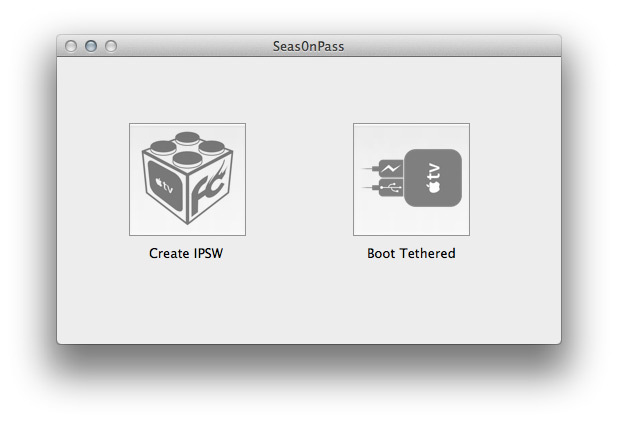 Step 1: Download the latest version of Seas0npass for either Mac or Windows depending on your operating system. When downloaded, unzip the ‘Seas0npass.zip‘ file and launch Seas0nPass. Step 2: As mentioned above, Seas0npass is based around a restore based jailbreak and therefore requires a custom built IPSW. Select the ‘Create IPSW‘ option to begin the process. Step 3: The latest Apple TV firmware (4.4.4) will be downloaded and Seas0nPass will use this file to create a custom jailbroken file. 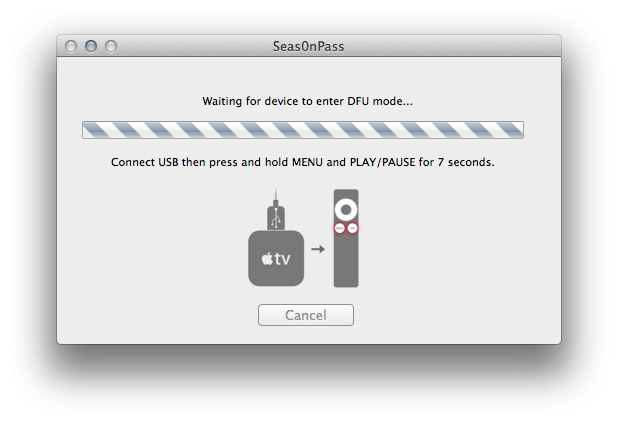 Step 4: When prompted by the tool, connect your Apple TV device to your Mac/PC using the Micro USB cable. Do not have the power cable connected at this time. The light on the front of the Apple TV will begin to flash rapidly, it is now time to point the remote at the device and hold both the MENU and PLAY/PAUSE buttons for seven seconds. Step 5: After the seven seconds has elapsed, release the buttons. iTunes will automatically open and begin the restore process. Don’t be alarmed by the windows that you see opening on the screen. Step 6: After the process is complete, iTunes will confirm the successful restore. Your Apple TV is now jailbroken. You can check this by connecting the device to your television and viewing the interface. In the bottom right hand corner you should see a temporary ‘FC’ logo which confirms a successful restore. If you have any previous experience of jailbreaking an iOS device, you will find the above process very similar to creating a custom firmware using PwnageTool or Sn0wbreeze. One fundamental difference comes when the jailbreak process is complete. You will notice upon inspection that Cydia is no where to be found, this is because Cydia is not installed as part of the process and will not be used on an Apple TV. With that said, with a little on line investigation you will find many useful and handy add ons for the device which definitely make it a worthwhile venture.